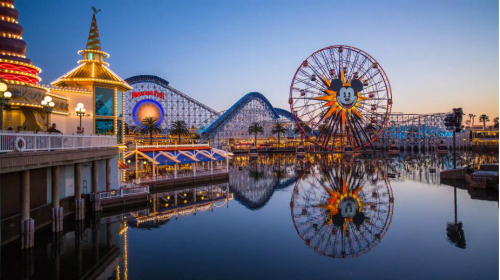 Theme parks, Disneyland in particular, were a huge part of my childhood, and my husband and I have been taking our little girl to various amusement and theme parks since she was 9-weeks old. I've learned a few things along the way that have made our trips over the years much easier and far more enjoyable for all of us, and I shared them recently with a some friends who are taking their little ones to an amusement park for the first time in a couple of weeks. As I told them, a meltdown at some point in the day is kind of expected (at one visit to Disneyland we actually heard parents negotiating with their children at every turn), but it doesn't have to ruin the day. Dress them in comfy clothes and shoes, then have these essentials on hand to help make it a great day. Between the petting zoo, shaking hands with the characters, and waiting in lines at the rides, your kids hands will come into contact with countless germs. And that's all before the little one drops ice cream down the front of their shirt. The point is, wipes are beyond necessary, so pack plenty. After hours of waiting in lines, weaving in and out of crowds, or being scared half to death on Mr. Toad's Wild Ride, a treat might be in order to prevent a meltdown. Time is of the essence, so tracking down an ice cream or churro vendor and then waiting in that line is out of the question. Keep small treats like tootsie rolls or DumDum lollipops on hand. If you're averse to giving them candy, have freeze dried fruit or energy balls at the ready. You may think your five-year old will be fine without his stroller, and maybe he will, but it's still a good idea to bring one just in case. Your little one may not need it, but coats, bags, and any souvenirs you pick up throughout the day will find a happy home in the stroller basket and seat. Though you may not even need them (hopefully you won't), have band-aids handy so there's no need to find a park employee or hightail it to the first-aid office in the event of a minor injury. Plus, most kids love wearing them (so you may want to offer them even if you little one doesn't have an ouchie). Bonus points if they have fun characters on them. You probably already pack extra clothes for babies and toddlers, but sometimes it's a good idea to have a change of clothes for school-aged children too. Accidents happen, spills occur, animals at the petting zoo can be unpredictable, and water rides, though enticing on a hot day, will leave them sopping and uncomfortable. Because when a favorite ride is shut down or a beloved character isn't available that day, a great big balloon might help, and many of the wandering vendors at amusement parks only take cash. And at our most recent Disney trip, we had to wait for one vendor's credit card machine to reboot before we could pay, which it never did (we ended up getting free Mickey Mouse lollipops after waiting patiently for five or six minutes). If you opt to drive home instead of staying at a nearby hotel, have soft clothes or jammies to make their ride home more comfortable (plus you can put them right into bed once you're home), as well as their favorite blanket and or stuffed animal. They'll no doubt be wiped, and making them as cozy as possible will be the happy ending to their fun day.